That's terrible, heart wrenching news. So many things could have caused their death but I have a feeling it may have been partially related to the heat. Louise doesn't live far form you and she has been finding many pigeons with severe canker. Most pigeons have the parasite in their system that causes canker and it's brought out during times of stress. The extreme heat can sure bring on an outbreak. How did the poop look? Did you notice any bad odor from the pigeons or their poop? First and foremost, I extend my sincere condolences on the loss of your birds. It sound to me like one or both parents might have had something, passing it along to the babies, given one of the babies died a day after hatching and now the second baby and both parents have passed away. Without a necropsy, it would be impossible to determine exactly what caused the deaths. I don't recall if you're familiar with Dr. Hauck so I'm going to post his information in the event you need a vet's assistance in the future. It may seem quick if they have had it for a while and you don't know they have it. As a natural defence, birds pretend to be OK even when they are not. A bird that act sick in the wild would stand out to a predator. Given birds pretend to be OK even if they aren't, you may not have noticed. Once we notice, the birds is very sick. I believe wh have talked about Dr Hauck before and if memory serves me correctly, you did take one of your birds to see him some months back. He is a great resource in your area and has been wonderful about treating feral rescues. I tried a few ways to use the attach tab but i could not get it to work. Bet i am doing something really simple wrong. Can you point me in the right direction? Regards Fred S.
I hope this helps, and look forward to seeing your birds. Very nice cage set up Fred. Is the cage always in the blue tent or does the cage get natural sun light? If you have 2 pijjies that can't get out to fly it would be good for them to get some sun too... but I'm sure you know that. We don't let any of our pigeons free fly but from what I understand there are a few different training 'steps' that have to be done. Putting a cage with the pigeons outside on the loft so they can see around the property & know what to look for when free flying home, is just one of them. That's a nice cage, Fred. It reminds me of the one my son built for my Sammy and Romey. While the cage I have for Sammy and Romey is about the same size, the alone are the occupants although it could house another couple. 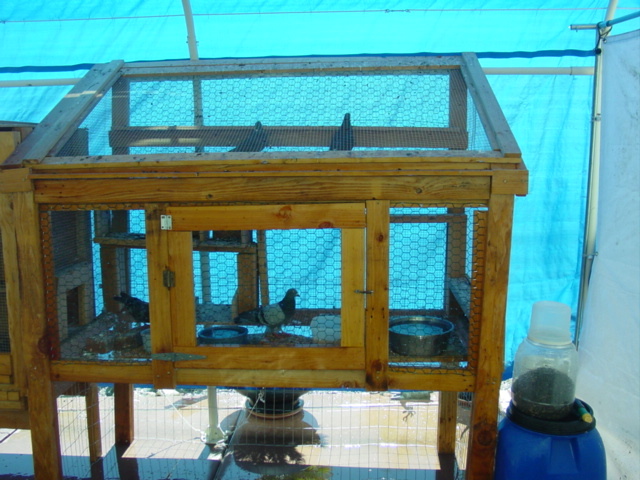 Pigeons need a minimum of 2 1/2 square feet per bird although they do much better with a larger space. Having more space cuts down on squabbles. Each couple need at least one nest box, although they like to have two. 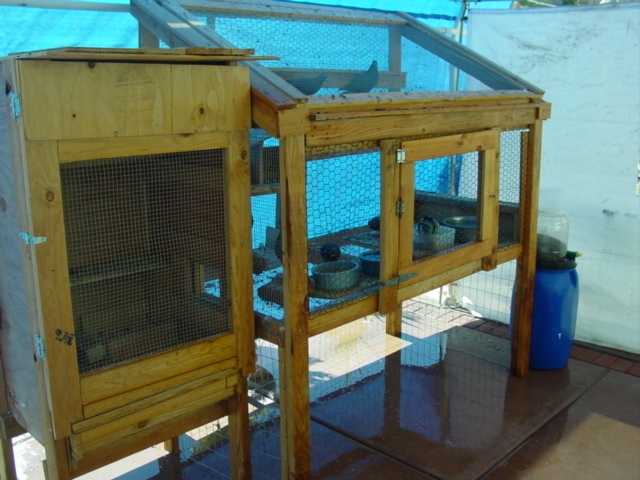 The ones I have are large enough so that both birds can comfortably sit in the box at the same time. My boxes have a lip across the bottom to keep the nesting material from fallen out. I give them Timothy Hay for nesting material and they love to arrange the pieces in the box. You can buy Timothy Hay in small bundles at the pet store in the rabbit section. If you do pick some up, buy a bag that has the longest pieces in it. You will have a ton of fun watching them with it. If you have space to build a larger loft, one that you could walk into, that would be wonderful. I know that food for feral pigeons in Las Vegas is difficult to come by and many that visit your place, finding food and water would be inclined to stay and continue to return. Certainly, any babies raised there would. Fred...I love the misting idea. Several here do that when it's hot and the birds do enjoy it. I do too I want to have those in the new flights for use in the summer. Can you recommend any companies that sell them online Fred? Or anyone else that uses them? I was able to get mine at the HOME DEPOT here in Las Vegas. They come in all degrees of quality and cost. My set hooks up to a hose bib and i put a battery operated timer on the circuit, also a Home Depot item. The better mister kits ave brass or bronze nozzles on flexible nylon tubing. These will last for many years and not clog up with water sediment. It they do at all there is a cleaner wire with the kit to open them up. Hope this helps Regards Fred S PS I think Home Depot will do mail order anywhere in the country , if one is not close buy. Thanks so much for the information Fred It does help alot 'cause now I know where to go to look at them! Subject: Re: looking for answers?